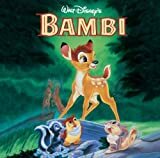 Accueil Bande originale Animation – Bande originale La bande originale de “Bambi”. La bande originale de “Bambi”. Compositeur : Edward H. Plumb. Paroles : Frank Churchill et Larry Morey. Adaptation française : Luc Aulivier et Claude Rigal-Ansous. Sortie : 30 Janvier 2001. 1. Main Title (Love Is A Song) (Donald Novis) – 2:55. 2. Morning In The Woods/The Young Prince/Learning To Walk – 5:13. 3. Exploring/Say Bird/Flower – 6:01. 4. Little April Shower – 3:53. 5. The Meadow/Bambi Sees Faline/Bambi Gets Annoyed – 4:55. 6. Gallop Of The Stags/The Great Prince Of The Forest/Man – 4:10. 7. Autumn/The First Snow/Fun On The Ice – 4:40. 8. The End Of Winter/New Spring Grass/Tragedy In The Meadow – 2:32. 9. Wintery Winds – 1:09. 10. Let’s Sing A Gay Little Spring Song – 1:41. 11. It Could Even Happen To Flower – 1:59. 12. Bambi Gets Twitterpated/Stag Fight – 2:32. 13. Looking For Romance (I Bring You A Song) – 2:08. 14. Man Returns – 2:03. 16. Rain Drops (Demo Recording) – 1:37. 17. Bonus Interview – Richard Kiley : Walt Disney. 18. Bonus Interview – Richard Kiley : Ollie Johnston et Frank Thomas. 19. Bonus Interview – Richard Kiley : Henry Mancini. La chanson de la pluie.